South of the Netherlands, west of Germany, north of France and just a hop away from the UK, Flanders is the perfect European hub for commerce. Find out what makes it a strategic location in the heart of Europe’s economic power base. 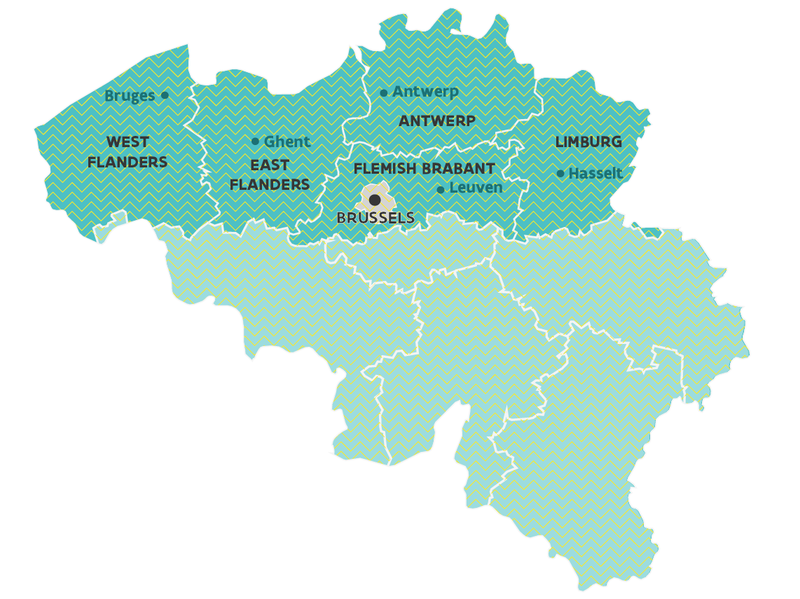 Flanders is one of the three independently-governed regions of Belgium. The capital of Flanders is Brussels, home to NATO, the EU and other major public and private international decision-making centers. Flanders, the northern half of Belgium, sits in the epicenter of Europe’s purchasing power. Belgium is the most globalized country in the world (according to ETH Zurich’s KOF Index of Globalization in 2018), which makes it the perfect place for business and foreign investment. 60%: that’s how much of Europe’s purchasing power is located within a 500 kilometer radius of Flanders. This means that Europe’s main markets can be reached in less than 24 hours. Flanders is centrally located within this megalopolis – stretching from Greater London to the Netherlands, Belgium, and parts of Germany and France. As such, the region ensures smooth access to one of the world’s highest concentrations of people, money and industries. To top it all off, Flanders is a great place for setting up logistics activities, essential to tap into this vast market potential. To put this into perspective: despite its small area of 13,522 km², Flanders boasts over 800 European distribution centers (EDCs) – the highest density of EDCs in all of Europe. The central location of Flanders is a key performance indicator for the competitiveness of the region. As such, we are in the middle of the European market for our products. In a recent benchmark, Financial Times listed the region of Flanders as the 2nd most attractive region among neighboring areas. Flanders scores low in costs, and very high in quality.